On this episode of Animation Damnation the guys break down what is, without question, the absolute worst episode of the X-Men animated series, "Jubilee's Fairy Tale Theater." 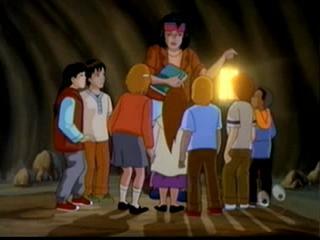 Originally airing November 16th, 1996, the episode showcases Jubilee's secret mutant power: telling garbage stories. After getting a group of school children trapped in a cave-in, Jubilee distracts them from their impending deaths by spinning a fantasy yarn where she's a magical elf, Wolverine is a troll, Gambit is a Robin Hood-esque creep, and Magneto leads an army of walking, talking suits of armor. All this because stupid Xavier had to go meet with the President!